Weener Plastics (WP) designs, develops and manufactures plastic packaging components – caps, closures, roll-on balls, bottles and jars – for personal care, food and home care applications. WP Netherlands, with factories in Tilburg and Ede, produces and assembles lids, measuring spoons, Aerosol Spray Caps and dispensing closures. Its clientele includes both national and international brands as well as private label manufacturers. WP Netherlands is part of the global Weener Plastics organisation and, with 24 facilities in 16 countries, plays an important role within the group. This is not only due to its production facilities, but also to its "excellence centres" for Nutrition Packaging, Aerosol Spray Caps and Dispensing Closures. WP distinguishes itself by taking the initiative proactively to introduce new solutions that are both innovative and cost-effective. Customers from across the globe can call upon WP to serve them throughout the entire packaging process – from initial ideation and design to tooling and high volume production. In the field of Nutrition, the Dutch market and surrounding area is of great importance to WP. This is where the circumstances for dairy farming are optimum and where the most modern dairy and milk powder factories can be found. The Netherlands profits economically from the growing global demand for milk and (baby) milk powder, as WP is capitalising on this demand. The company sees a positive future ahead and can provide further growth both within and outside Europe. The inventive development team at Weener Plastics (WP) in Brazil developed the Eco Green Tube, an environmentally-friendly, mono-material squeeze tube for Personal Care solutions. Sustainability was the key challenge for the development of this standard 40 mm tube, being the first real “green tube” in the market. With a production base in Brazil, the Latin-American market is targeted. As pressure to ‘think green’ escalates through the roof, sustainability continues to be an integral part of Weener Plastics’s strategy. Boasting unrivalled technological competences, the company develops packaging components for the personal care, food & beverage, and home care markets, working incessantly towards minimising its carbon footprint. Ilona Vermeer underscores the importance of sustainability solutions for Weener, explaining how it is determined to make the plastics packaging industry circular in the next years. Henkel and Weener Plastics have teamed up to translate a challenging new laundry detergent closure design into reality. The result is an appealing, functional dispensing closure that perfectly complements the newly designed bottle and has the ultimate mix of characteristics: a sustainable system with excellent pouring behavior, suitable for e-commerce use and optimal efficiency in manufacturing and logistics. For many years, Nivea has been Beiersdorf’s loved and always reliable global skin care brand. Great care was taken in selecting a packaging supplier for their new female deodorant and anti-perspirant range. Weener Plastics (WP) was chosen to design, develop and manufacture the new twist-lock spray cap, including development and manufacturing of the tooling. Weener Plastics (WP) Group acquires Latin American packaging solutions provider Proenfar from Altra Investments. The agreement was signed on 23 April 2018. With this acquisition, plastic packaging supplier WP continues its expansion in emerging markets and strengthens its product portfolio. The parties have agreed not to disclose the purchase price. The transaction is subject to customary closing conditions. Plastic packaging supplier Weener Plastics (WP) Group, headquartered in the Netherlands, has acquired bottle manufacturer Artpack Ltd in Russia. The transaction closed on 20 February 2018 for an undisclosed amount. This acquisition fits perfectly within WP’s global expansion strategy. Nivea Hand Care’s alluring packaging isn’t just pleasing to look at. Picking it up is almost irresistible – and delivers a pleasant consumer experience. That is why the appealing packaging has received several awards in 2017, such as the Red Dot Design Award for Communication Design and the German Packaging Prize. A welcome compliment for the hinged dispensing closure produced by Weener Plastics, which is functional, convenient, reliable and attractive. Weener Plastics (WP), headquartered in The Netherlands, has acquired the shares and operations of Orange Products Plasticos Ltda in Brazil (OPB) from Orange Products Inc (OPI) and C-Pack, its current shareholders. The transaction was closed on 11 October 2017 for an undisclosed amount. This acquisition is in line with WP's M&A strategy. Visual quality, sustainability and convenient handling is why renowned brand owners have chosen Weener's new CosmoTop tube closures. The alluring dispensing closures combine weight reduction with proven consumer benefits whilst giving the package an attractive look. CosmoTop lines stand for upmarket tube closures and benefit from two lid design options. A new standard shaving actuator is about to be introduced onto the market. Weener Plastics' sturdy Dave shaving actuator offers gentle and convenient dispensing for foam and gel. Weener Plastics is strengthening its well-established position as a strong, competent and reliable full service global supplier of innovative plastic packaging solutions. Therefore, it is implementing a new corporate identity, the HQ is being relocated and several name changes are being executed. Out of more than 70 global suppliers for plastic caps, closures and bottles, Weener Plastics (WP) US has been awarded the Vendor of the Year award by TricorBraun, based on its vendor performance report systems. Weener Plastic Packaging Group (WPPG) has acquired the shares of its joint venture partner Globalpack and currently owns 100% of Weener Globalpack Indústria Plástica Ltda in Jaraguá, São Paulo, Brazil. The plant produces plastic packaging components for deodorants and antiperspirants. The company has been renamed and will operate as Weener Indústria Plástica Ltda from now on. 3i Group plc (3i), the international investment manager, has agreed to invest approximately €250 million (c. £183million) in Weener Plastic Packaging Group, a leading manufacturer of innovative plastic packaging systems for the world’s leading FMCG companies and private label manufacturers. The former shareholder, Lindsay Goldberg Vogel, has sold its stake in WPPG. Weener has launched its new corporate website - www.wppg.com. Plasticum - part of the Weener Plastic Packaging Group since June, 2013 - has been integrated into the new site. The fully redesigned website has a contemporary look and feel, and much more user-friendly navigation, following the latest world wide web web standards. The new site reflects the company's focused strategy and the capabilities to meet today's customer needs. Hochland, the leading expert for cheese products in Europe, has recently launched a new range of cream cheese products. Being a valued supplier for many years, Weener Plastic Russia was awarded the job to design and develop the complete new packaging range. The packaging is functional and appealing. The jars and lids are injection moulded while decorated with an In-Mould-Label and have been optimized to offer a stable and sound filling process on high speed filling lines. The Weener Plastic Packaging Group has developed a new patented cost-effective dosing system: the Pure Dispense technology. The applied membrane is a sustainable solution for an accurate and controlled dispense of various formulations, thanks to the efficient and direct movement of the membrane when squeezing the tube or bottle. It is particularly suitable for personal care solutions, such as creams, gels and lotions. 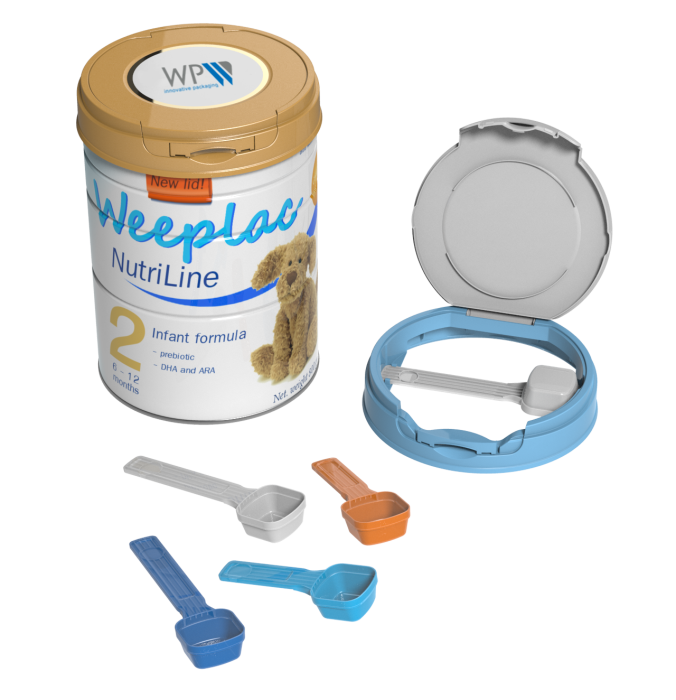 Weener Plastics has developed the Nutri-Line, a new total packaging concept for a safe and hygienic dosing of infant formula which benefits a patented tamper-proof indicator. The Nutri-Line features a hinged lid with a convenient grip for easy opening and closing, and an integrated stackable scoop. After being a minority shareholder for 8 years, the Weener group, a German based globally active corporation, has acquired the remaining shares of the Mumbai headquartered Weener Empire Plastics Ltd for an undisclosed amount. The deal includes 7 factories across India. In order to support customers internationally even better in the future and expand Weener's market position, the Weener Plastic Packaging Group will restructure: The Dutch Plasticum Group B.V. with its 300 employees and four European production facilities will be integrated into the Weener Plastic Packaging Group as a subsidiary. To fully exploit the considerable international potential in the personal care, food and beverage, home care, chemical, and pharmaceutical packaging markets, Weener Plastic Packaging Group located in Weener (Lower Saxony) has restructured. Plasticum Group B.V. of the Netherlands, with its 300 employees and four European plants, will be integrated into the Weener Plastic Packaging Group. Lindsay Goldberg acquires Plasticum Group B.V. Private equity firm Lindsay Goldberg LLC, New York, in Central Europe represented by Lindsay Goldberg Vogel GmbH, has acquired Plasticum Group B.V., the Netherlands. The Competition Authorities have already approved the acquisition, that has been fully financed with own equity capital. Plasticum, market leader in aerosol caps, recognizes the market need for high quality, cost-efficient and eco-friendly products. Therefore Plasticum has developed Sunshine, a lightweight 65 mm over cap for ambitious customers in the technical aerosol market. Sunshine is unique and distinguishes itself from the competition as it offers several benefits to efficiency on the line, during packing, and throughout delivery. Revlon, a renowned global A-brand in the cosmetics market, has chosen Plasticum’s Jessica for their successful brand Charlie. This integrated spray actuator has been adopted for the aerosol body fragrances, fitting into the company’s vision of “glamour, excitement and innovation through high-quality products at affordable prices”. Within a very short time, new beverage additives have turned into a real lifestyle product. This development is another manifestation of the global trend toward increasing personalization, where we adapt the products we use to our own preferences and wishes. On behalf of a US manufacturer, Weener has recently started to produce a complete package for such added flavours. Plasticum extends its range of horizontal spray caps with Jill, wich is fitted with Plasticum’s patented Integrated Spray technology, integrating the actuator and insert. Plasticum's technology offers the flexibility to handle various formulations and to obtain different spray patterns, depending on the required effect. Plasticum has extended its valve closure range with a new oval closure fitted with two tamper evident functions. This closure has been designed for food and personal care applications. It is offered in two neck sizes: snap-on 25 mm and snap-on 27 mm. Plasticum has announce the launch of its new corporate website www.plasticumgroup.com. The completely re-designed site has a fresh look and feel and user-friendly navigation. It reflects the company's strategy and shows the latest innovations and developments to meet customer needs. Weener has produced the press-top cap for the KPSS-Kao Professional line of KMS California hair care products. The innovative (and for this product segment, entirely new) soft-touch surfaces plus an improved cap are what characterise the KMS California product range.